Our favourite chef, Peter Gordon, talks us through these wonderful Expedition Tea infused chocolate truffles! Peter Gordon is renowned for his unique culinary philosophy and playful fusion cuisine which has had great influence on his distinguished restaurants and books. 4 teaspoons of Dr Jackson’s Expedition Tea (or the contents from 2 Expedition teabags), 250g double cream, 25g unsalted butter, 200g dark chocolate (65 – 80 %), chopped (if the pieces are too large, the chocolate may not melt and remain lumpy), 4 tablespoons cocoa powder for rolling. Place the Expedition Tea and cream into a small saucepan and slowly bring to a simmer, gently stirring as it warms up. Put a lid on, turn the heat off and leave to infuse for 10 minutes. Bring back to a simmer, then add the butter and stir until it has melted. Have the chocolate in a clean heat-proof bowl. Strain the hot cream over the chocolate and gently stir until the mixture becomes smooth and all the chocolate has melted. Leave to cool at room temperature for 15 minutes, then cover with clingfilm and place in the fridge for at least 2 hours to firm up. Scatter the cocoa on a large plate or tray. Use a teaspoon to scoop out the mixture at whichever size you like. Using both hands (and you might want to wear gloves) roll the pieces into balls (they don’t have to be perfectly round) and then roll these balls in the cocoa powder to coat evenly. You can do this in 4 or 5 batches. Store in the fridge in a single layer in an airtight container. Remove from the fridge 30 minutes before serving so they soften up a little. If the cocoa has become patchy on them, simply re-roll in extra cocoa powder. 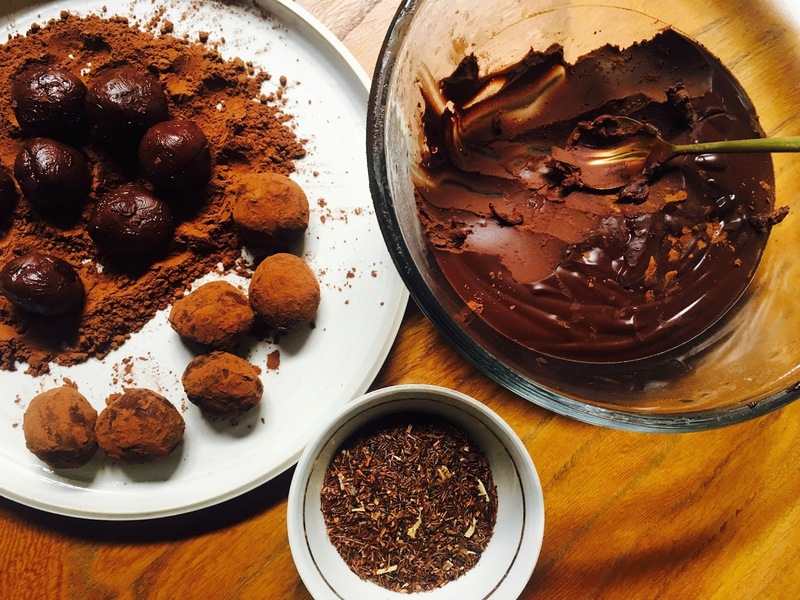 These wonderful chocolate truffles are great to have with a strong coffee after lunch, or served after dinner as a caffeine-free treat. Don’t forget to follow Peter Gordon for more culinary adventures: Instagram, Facebook, Website, Books.